samples the gimbap, grilled beef and hotpot at a no-frills Korean restaurant in Ba Dinh District and finds that the simple, healthy flavours offer a welcome variation from standard fare. Steamy satisfaction: The kalbi, or cartilage hot pot, is a specialty of the restaurant. As temperatures in the capital drop, people get together to seek warmth and solace. The need to find a comfortable place for eating out led us to Gimbap Restaurant in Ba Dinh District. Hiding humbly on the corner of a small alley, the four-floor restaurant bears no fancy or brilliant signboard, nor does it have any exquisite design. However, as we settled on the fluffy mattress, we felt our discomfort ease. We left the decision of what to eat in the hands of my colleague who picked the restaurant. With the incredible speed of serving here, within minutes we had fried gimbap, or rolled rice similar to sushi (VND30,000) and fruit salad (VND50,000), as well as little dishes of cucumber, salted eggplant and kimchi. One of my friends was quite surprised by the style of the Korean meal and asked the owner why there were so many vegetable dishes on the table. "On the table, you can see the diversity of food, especially vegetables, with various kinds of mushrooms, beans and seaweed. The five colours represent the five main ingredients, making the table just like a work of art: Fried eggs are golden, chilli is red, vegetables are green, seaweed is black and mushrooms are white," responded Nguyen Thi Hien, the owner. Like Vietnamese cuisine, she added, Korean food is light, healthy and close to nature. The grilled beef (VND150,000) was truly mouth-watering. Thin-sliced, marinated with white wine and wrapped with raw vegetables, the meat had a delectable aroma and was served with a sweet sauce. "I can eat as much as I want without the fear of gaining weight. That's what I like about Korean food," said Bui Quynh Hoa, one of my colleagues. The kalbi, or cartilage hot pot (VND300,000), was our favourite dish. "There were so many ingredients in the hotpot. 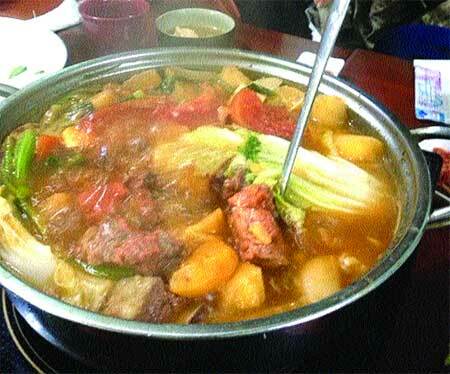 The pot was placed at the centre of the table and beef, vegetables and mushrooms were added to the broth slowly. I must say, the taste was quite different from what I've tried previously," Hoa said. A large hotpot can serve up to eight people, making it as affordable as a typical meal. Plus, nothing compares to savouring cartilage hotpot with sochu on a cold, windy day! When we had almost finished lunch, the sweet taste of taro kept us staying longer. "You know, the flavour at the bottom of the pot is always the best," Hien said to us. She stood up to bring us a bunch of ramyeon, or Korean instant noodles, similar to those eaten in Ha Noi. All we had to do was wait 15 minutes and a bowl of hot ramyeon with mushrooms was placed in front of us. We were full up to our heads, but we appreciated the warm noodles. The restaurant also offers naengmyeon, cold noodles, and jajangmyeon, black noodles. The two could satisfy any desire for noodles from Korea.